With over 15 years of experience, Cuba Incentives has proven itself as a trustworthy business partner. In the past years we have accompanied thousands of individuals on their trip to Cuba. During these 15 years we have established strong relationships with all the suppliers in Cuba. With our 3 offices we are available almost 24/7 and our dedicated team is always ready to help you create that beautiful trip for your clients. We’re back safely from Cuba and had the most amazing time. Thank you for organising such an interesting trip. We absolutely loved our guide Antonio and driver Fidel. Antonio was fascinating – he’d been a Professor of Political Science and a Diplomat so his knowledge of Cuban history was wonderful. He quickly noted that the boys were not as interested in Revolution memorials as their parents! He took us to restaurants in the middle of nowhere which were delicious and always had somewhere interesting for us to stop at on long journeys. Fidel the driver hadn’t met Antonio before but they got on like a house on fire and were always laughing about something which was lovely. We loved the bands that accompany dinner wherever you are and have all become reasonable with the maracas! So thank you for arranging it all. I’ll email Kenia in Havana to let her know how brilliant we thought Antonio was. He really made our trip! Attached are photos taken on our auto trip of about a week, taken after the Jazz festival Tour in December and which we undertook on our own with invaluable help from Cuba Junky, but especially George–fantastic help and, in Cuba, Kenia–wonderfully helpful and always available. I thought you would have no shortage of pictures of the Jazz Festival tour portion of our trip. Just wanted to say a big thanks so much for organizing everything on our honeymoon. We had a fantastic time, and it’s hard to choose a favorite part as it was all amazing! Every aspect of the trip was very well organized, and our transfers were always early and made everything very straight forward. Everyone we dealt with from the Cubanacan etc. were very friendly and helpful, our tour guides in Vinales (I think her name was Anna) and Las Terrazas (Cecilia) in particular. Thanks again, and we will definitely be booking with Rickshaw at some point I’m sure- I see from your website you cover quite a lot of places! I started the Hospitality school in Curacao, but after two years I decided that working in hotels is not my thing. In the meantime my parents whom had established a DMC specialized in Cuba also came back to Curacao to live. This gave me the opportunity to start working with them after I quit my studies. 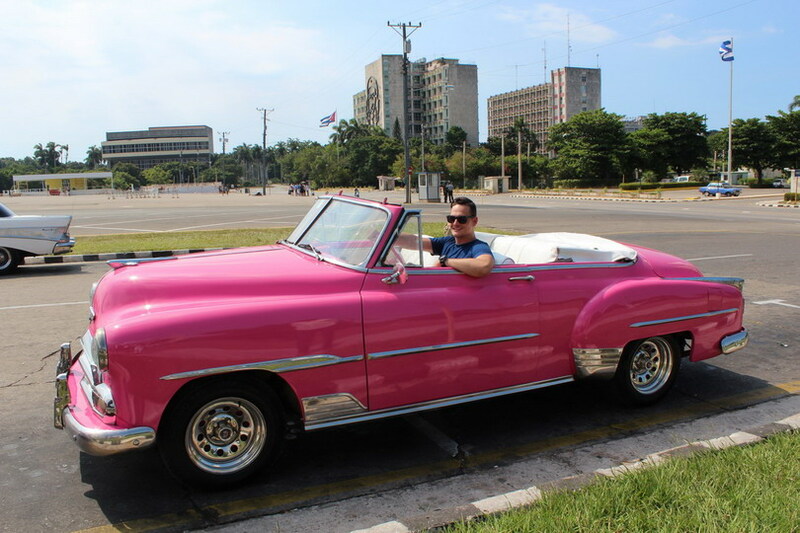 While Cuba is not the easiest destination, till date (10 years now) I still enjoy it every day! As said above, my parents started the company. My mission is to expand the company as far as we can. We like growth and grow every year, but we do not want to grow too fast or too much. We want to stay humble and close to our clients. Our clients must never become numbers. This is something that I cannot remember anymore as it has been a long time. I do often think about the new clients that we have gained also because my efforts. And knowing that we have grown so much with the help of myself. I am proud of every part of the company, we often get contacted by travel agencies wanting to work with us, because they hear good stories about us. That is something that makes me proud. That people recommend us to others. And another thing I am proud of is our ‘new’ webshop where people can buy the tourist cards for Cuba. We set up the website thinking we’ll send a couple of visa per week, but it turned out to be a very good step as we sell over 2500 visa per month through the website. Speed of working. We are a small team and we try to reply as fast as possible. When we send quotes within a couple of hours people are often astonished by the speed, as they are used to other Cuban DMCs which reply after weeks or don’t at all. We also feel that we have a very good price/quality balance. We are not, and never were or want to be, the cheapest, however in return for a higher price, we do offer good service before, during and after the trip, and to us that is more worth than being the cheapest. Going to work, sifting through my mails first to see if there is something that needs my attention immediately. Sometimes I help with all the orders of the webshop, some days we need to process over 100 orders within a couple of hours, so an extra pair of hands is needed from time to time. Other days I work on the offer requests that we receive because I like to do some of the daily work as well. I discuss new things with the team when there are changes in Cuba, and also with my web developer I discuss the projects we are working on to see the progress and to give him my input while still working on it to immediately apply changes rather than after months of working. My two kids . I am a new father of two boys and they make me get out of bed in the morning, go to work to make sure that the company is at the best it can be, so they can have a nice and careless childhood as I had myself. When there are problems in Cuba, for example hurricanes. They cause a lot of extra work and stress, and that can keep me up at night. I always want to have as much information as possible to inform my clients accordingly, but that is sometimes challenging because often power/internet/phones don’t work after a hurricane. I have clients on one side calling me to know more, but we have trouble connecting with the island to get more information. Luckily this does not happen often, and I can sleep pretty well at night. 9. What other CEOs do you look up to and why? I’ve always liked the story of Corendon founder Atilay Ulsu. He started his company not having any experience in the field, and now his company is one of the top 3 travel related companies in the Netherlands. That is something that I can really appreciate. While Cuba is relatively instable, and can change in the blink of an eye. We hope that we can keep selling Cuba and bring people to Cuba to visit this beautiful island. Our goal is to become sustainable as soon as possible, and to keep improving in this.